Who can apply in above Quota ? In this challenging economic landscape, organizations must develop and execute innovative strategies to survive and thrive. Performance and..
Heartiest Congratulations to Prof. Milind Moreshwar Kulkarni (Economics Department) for completing his Doctorate Degree. 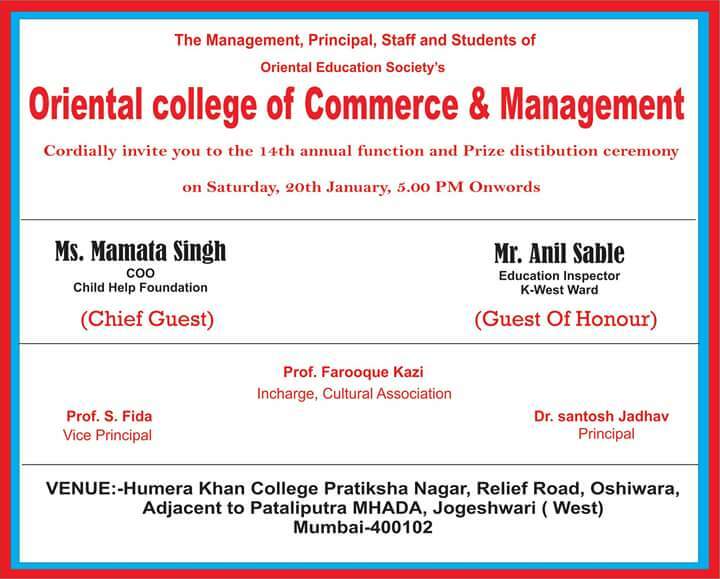 Cordially invite you to the 15th Annual Function and Prize Distribution Ceremony. BSC IT- ITECH Festival 2018-2019. Scholarship schemes in India by Ahsan. Exemption from PET to the Teachers working in Colleges affiliated to the University of Mumbai. Maharashtra set 2019 Important dates, Eligibility criteria, Application form. 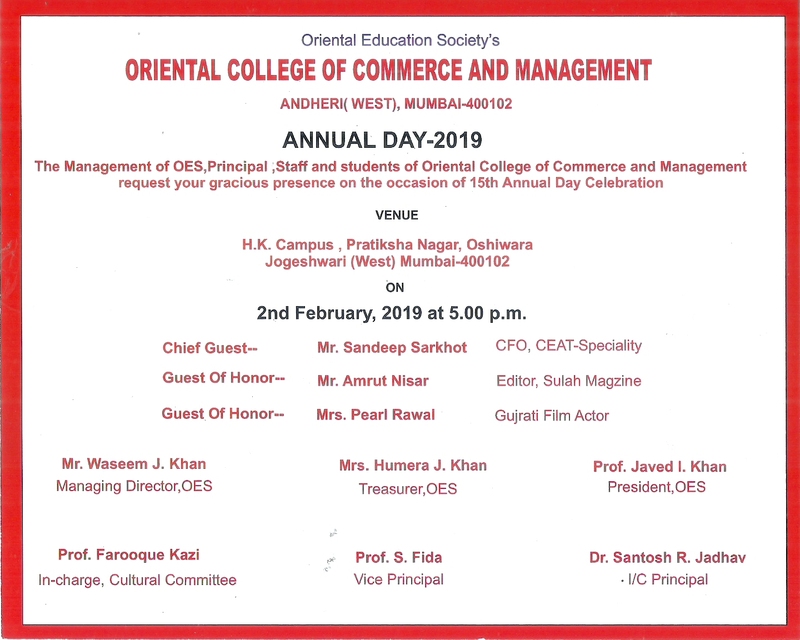 Annual Day Celebration on 20th January 2018, from evening 5.00 pm onwards at H K College of Pharmacy, H K Ground. “Life at OCCM transformed completely transformed the view point towards life. It not only helped in gaining technical knowledge but also inspired and motivated for all around development ranging from sports to cultural. The presence in the premier institute inculcated a sense of leadership, self-independence, and responsibility. The quality of education inspired to develop a mindset of reasoning leading to a sense of questioning to know the proof behind existence of things. The facilities at the institute never made us feel the absence of homelike facilities rather inspired to work hard and farewell. “As we express our gratitude, we must never forget that the highest appreciation is not to utter words, but to live by them” – John.F.Kennedy. The three golden years of my life spent at OCCM was a perfect roller-coaster ride. Through the ups and downs, I gained the strength to face challenges confidently and emerged out with flying colors. The encouragement to balance academics and co-curricular activities imbibed the sense of holistic development. Emphasis for discipline, respect for moral values along with quenching the ever-lasting thirst for knowledge made me a complete individual. The care and affection with which every member of OCCM family nurtured me has set deep gratitude and love for the institution. It has been a very delightful experience having spent 3 years at OCCM. These were my best years of my life. Thanks to OCCM for all encouragement and support. I was very happy to be an active member of the cultural activities that took OCCM to the top. Thanks to the faculty members for their love and support. OCCM Rocks, I am proud to be a member of OCCM family. My stay at OCCM is unforgettable. All the faculties were extraordinary and always available any time we had problems, we never hesitated to approach them. I never felt it was a new college. First time I saw OCCM it was an experience beyond words. It will forever be etched in my mind thus OCCM has become a part of my life. It has shaped my future and will continue shaping my future. I know OCCM will always be there for me when I need it. It was an amazing experience to be a part of such a reputed and disciplined institution. It was always a second home.Faculties are very kind, friendly and gave a parental advice when required. Discipline was given highest priority. I am proud to be at OCCM. Thanks to all for making 3 years of my life a memorable and sweet one. OCCM’s contribution towards what I’m today is immense .OCCM makes the student think and dream in a big way. It respects values, preaches and uploads ethics, never compromises. It has got all the traits and drive as a team to become one of the best institution ever! I had a terrific time in OCCM. I could actually nurture some skills like essay writing, oratory skills etc. I was lucky enough to be placed in campus. The department is excellent and the staffs are fabulous.